This is a recipe from the Weight Watchers collection. You can find this recipe and others like it at http://www.weightwatchers.com/food/index.aspx. The amounts in this recipe reflect the original version and the balance of flavors and textures is remarkable. However, in the category of “improving on perfection” (and probably more so because I just can’t leave well-enough alone), I’ve increased the amounts of olives and capers and have also used the caper juice. Keep in mind that caper juice is rather salty, so you’ll want to be aware of that and adjust accordingly. ■ adjective denoting a pasta sauce of tomatoes, garlic, olives, anchovies, etc. Ital., from puttana ‘prostitute’ (the sauce is said to have been devised by prostitutes as one which could be cooked quickly between clients’ visits). When the skillet is hot, add the chicken and cook until golden brown, about 5 minutes. 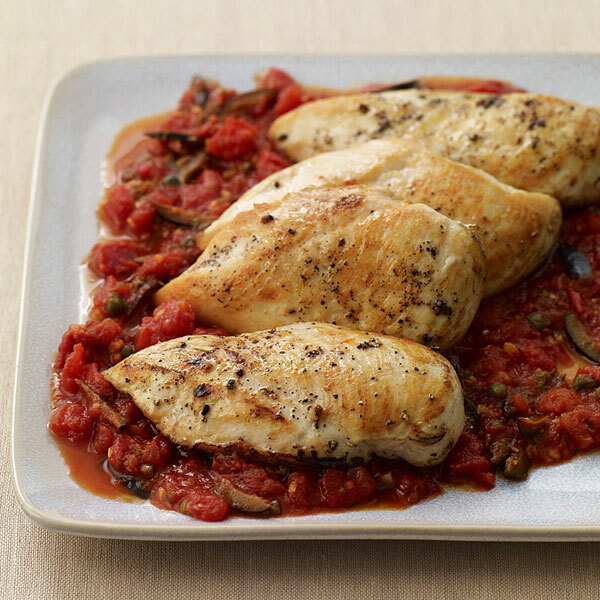 Turn the chicken over and continue cooking just until the chicken is cooked through, and an instant-read meat thermometer inserted into the center of one chicken breast registers 165°F, about 3 minutes more. Transfer the chicken to a plate and set aside. For the best taste, don’t gray the chicken breasts in the skillet. Be patient and brown them, giving them enough time over the heat and not over-crowding the pan. That caramelized flavor will permeate the meat — and will lie in little burned bits on the skillet’s bottom, waiting to be lifted off with this simple sauce of tomatoes, olives and capers.